Alright, you’ve been absent from this debate because, as you stated publicly months ago, you lost interest in it. That’s fine, welcome back. But since then, it has been made quite clear that Miskolczi’s theory was, in the first instance, an empirical discovery. The mathematical theory of M2007 that you are objecting to here was adduced “after the fact” to explain a series of well-documented empirical observations, as Ferenc has made quite clear earlier in this thread. All praise to Nick Stokes and Pat Classen who put considerable work into tearing the Miskolczi hocus mathepocus apart (look into their comments on the various threads). So now this waste of electrons is reduced to the claim that the optical depth of the atmosphere is held constant at 1.87 by compensating variations in the water vapor column density in the atmosphere. Well, at least for the Earth's atmosphere right now that is the value, but is it fixed and if it is what is the mechanism? We know that the atmospheric concentration of CO2 is rising which would increase the optical depth. The only way that the optical depth could then decrease is for the water vapor column density to decrease. Measurements show that the surface is warming. Since warmer temperatures will result in higher water vapor pressure, the only way that total water vapor would decrease would be for the excess water to rain out quickly. Although there is some data on water vapor column density from way back when, it is not of the highest quality, and the further back you go, the worse it gets. Is there another way to get at this? Why yes young fella, if you had the right satellite instruments you could look at the water vapor concentration as a function of temperature on the surface over a relatively small area. And guess what we have the right satellite instrument, the Atmospheric Infrared Sounder (AIRS) and Andrew Dessler and friends have used data from this instrument in a paper currently appearing in the Journal of Geophysical Research, and as you would expect if you were not Ferenc Miskolczi, the column density of water vapor increases as the surface temperature below increases. When forced with observed SSTs, this model successfully reproduces the observed column-integrated moistening changes over this period (Fig. 1). However, because the mass of water vapor decreases rapidly with height, the column integral is primarily weighted by the lower troposphere, and its largely thermodynamic behavior is unsurprising (21). Consequently, there is not much debate about the projected increase of column-integrated water vapor in response to global warming, and its agreement with models provides only limited reassurance in their simulation of water vapor feedback (9). In contrast, water vapor in the free troposphere is not so directly constrained by thermodynamic arguments (21), and its response to global warming has been the subject of long-standing controversy (9, 15–17). Given the radiative importance of moisture changes in the upper troposphere (9, 10), it is important that humidity changes there are demonstrably consistent between models and observations. Although an international network of weather balloons has carried water vapor sensors for more than half a century, changes in instrumentation and poor calibration make such sensors unsuitable for detecting trends in upper tropospheric water vapor (27). Similarly, global reanalysis products also suffer from spurious variability and trends related to changes in data quality and data coverage (24). Climate models predict that the concentration of water vapor in the upper troposphere could double by the end of the century as a result of increases in greenhouse gases. Such moistening plays a key role in amplifying the rate at which the climate warms in response to anthropogenic activities, but has been difficult to detect because of deficiencies in conventional observing systems. We use satellite measurements to highlight a distinct radiative signature of upper tropospheric moistening over the period 1982 to 2004. The observed moistening is accurately captured by climate model simulations and lends further credence to model projections of future global warming. "Some will find strengths in McCain that they value more highly than the commitment to reasoned assessment that appeals in Obama. But all the signs are that the former seeks a narrower range of advice. Equally worrying is that he fails to educate himself on crucial matters; the attitude he has taken to economic policy over many years is at issue here. Either as a result of poor advice, or of advice inadequately considered, he frequently makes decisions that seem capricious or erratic. The most notable of these is his ill-considered choice of Sarah Palin, the Republican governor of Alaska, as running mate. Palin lacks the experience, and any outward sign of the capacity, to face the rigours of the presidency. The Oval Office is not a debating chamber, nor is it a faculty club. As anyone in academia will know, a thoughtful and professorial air is not in itself a recommendation for executive power. But a commitment to seeking good advice and taking seriously the findings of disinterested enquiry seems an attractive attribute for a chief executive. It certainly matters more than any specific pledge to fund some particular agency or initiative at a certain level — pledges of a sort now largely rendered moot by the unpredictable flux of the economy. This journal does not have a vote, and does not claim any particular standing from which to instruct those who do. But if it did, it would cast its vote for Barack Obama. Usually the bunny keeps politics out of the blog, but this is where policy meets the road. 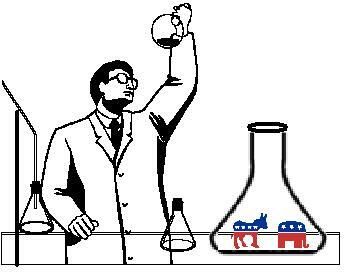 You can read Obama's and McCain's answers (well actually their advisors answers) to science policy questions. Popular Mechanics has a nice matrix of the policy positions of the candidates including those who dropped out of the primaries. You can find some of Biden's positions there and compare the primary season answers of the candidates to the election positions. Palin asked for a make-up. Cap and Trade Programs for Reducing Greenhouse Gas Emissions. Both candidates reject a federal tax on carbon emissions of the sort that was advocated by former Vice President Al Gore. Both Yeager and Kammen said that the candidates see a cap and trade regime as being stronger and more sensitive in its ability to control carbon emissions. Generally, a cap-and-trade program sets limits for greenhouse gas emissions. The government would sell the permits or give them away; utilities and industries that emit the gasses could buy them and sell them. Over time, fewer permits would be available, and the cost presumably would be higher. That would help reduce overall emissions. Both campaigns have staked out their objectives: Obama would auction the permits to reduce carbon emissions by 80% below 1990 levels by 2050. McCain's goal is a 60% reduction by 2050. At the Stanford debate, Kammen said auctioning the permits would essentially set a price for polluting, and that proceeds could be used for a variety of purposes, including efforts to promote green development and green jobs in low-income urban and rural areas. He was critical of McCain's program, joining other analysts who have found that it would initially give some of the permits away. That approach that has been questioned by some critics who say that creates insufficient incentive for polluters to stop polluting. Yeager insisted that McCain's plan would not give away permits. It would set firm objectives in five-year increments and hold polluters accountable for meeting them. That would be effective without bankrupting private industry, he said. A cap-and-trade regime has to be a "sustainable strategy that gets beyond the enthusiasm of the moment" so that it can endure long-term, he added. Here begins a new chapter for the William Nierenberg Book Club. If you have not been paying attention, places to catch up include Stoat, Stoat, Stoat, Atmoz, Nierenberg Central, and yr. humble hare here, here and especially here for the background to this post. To make a long and a short of it, William Nierenberg was a founder of the George Marshall Institution with Robert Jastrow and Fred Seitz, president of the Scripps Institute, a member of the National Academy, etc. He is not especially a favorite of Naomi Oreskes, who has assigned him considerable responsibility for blocking early action on climate change (read the links damn it!!). While those other characters have been looking at Jason and NAS reports (read the links damn it), Eli has acquired at considerable cost ($0.41 + postage) a copy of Scientific Perspectives on the Greenhouse Problem, by Robert Jastrow, William Nierenberg and Fredrick Seitz (nice to see that they followed the mathematicians practice for author lists) published by the Marshall Institute in 1990. The first 61 pages are by the JNS team, and Eli assumes for convenience that perhaps with some small changes, they are the same as the manuscript circulating in 1991 which was described by Jerry Mahlman as "noisy junk". The book is being read by the bunny book club but Eli thought he would give you a taste of the thing starting with Figure 1. Fig. 1 Comparison between observed global average temperature and calculations by Hansen, et al. (2) based on a computer simulations of the greenhouse effect. the dashed line indicates the calculated temperature increase caused by carbon dioxide increases since 1880. The solid line indicates the observed temperatures for the same period. 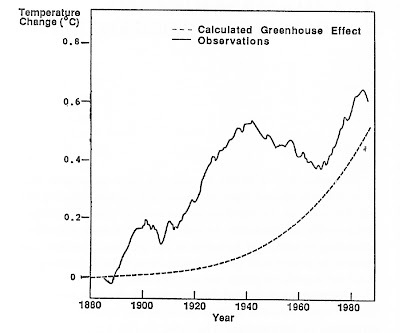 The zero point in the calculated curve has been adjusted to agree with observations for the 1880s, since nearly all the anthropogenic greenhouse warming occurred subsequent to that time. both curves show a 0.5 C rise over the 100 year interval, However, the observed temperatures, unlike the calculations, show a rapid rise in the first 50 years followed by a decrease from 1940-1970. Young and innocent readers, let us see why this is a fitting entry into the 1990 Golden Horseshoe Award. Summary. The global temperature rose by 0.2 °C between the middle 1960's and 1980, yielding a warming of 0.4°C in the past century. This temperature increase is consistent with the calculated greenhouse effect due to measured increases of atmospheric carbon dioxide. Variations of volcanic aerosols and possibly solar luminosity appear to be primary causes of observed fluctuations about the mean trend of increasing temperature. It is shown that the anthropogenic carbon dioxide warming should emerge from the noise level of natural climate variability by the end of the century, and there is a high probability of warming in the 1980's. Potential effects on climate in the 21st century include the creation of drought-prone regions in North America and central Asia as part of a shifting of climatic zones, erosion of the West Antarctic ice sheet with a consequent worldwide rise in sea level, and opening of the fabled Northwest Passage. The NW Passage has indeed opened in the last two years, but didn't you get the idea from Bob, Bill and Fred that Jim and his buddies assigned all the the change since 1880 to CO2? Guess again, what Hansen et al. actually tried to do was to constrain the climate sensitivity and changes in the solar constant to obtain the best fit to observations This WAS published in 1981 and the models were considerably less sophisticated, almost as unsophisticated as the denialists claim now. Radiative forcing by CO2 plus volcanoes and forcing by CO2 plus volcanoes plus the sun both yield a temperature trend with a strong similarity to the observed trend of the past century (Fig. 5), which we quantify below. If only the heat capacity of the mixed layer is included, the amplitude of the computed temperature variations is larger than observed. However, mixing of heat into the deeper ocean with k = 1 cm2 sec-1 brings both calculated trends into rough agreement with observations. The main uncertainties in the climate model-that is, its "tuning knobs"-are (i) the equilibrium sensitivity and (ii) the rate of heat exchange with the ocean beneath the mixed layer. The general correlation of radiative forcings with global temperatures suggests that model uncertainties be constrained by requiring agreement with the observed temperature trend. Therefore, we examined a range of model sensitivities, choosing a diffusion coefficient for each to minimize the residual variance between computed and observed temperature trends. Equilibrium sensitivities of 1.4°, 2.80, and 5.6°C required k = 0, 1.2, and 2.2 cm2 sec-1, respectively. All models with sensitivities of 1.4° to 5.6°C provide a good fit to the observations. The smallest acceptable sensitivity is - 1.4°C, because it requires zero heat exchange with the deeper ocean. Sensitivities much higher than 5.60C would require greater heat exchange with the deep ocean than is believed to be realistic (21, 22). Radiative forcing by CO2 plus volcanoes accounts for 75 percent of the variance in the 5-year smoothed global temperature, with correlation coefficient 0.9. The predicted CO2 warming rises out of the lσ noise level in the 1980's and the 2σ level in the 1990's (Fig. 7). . . Nominal confidence in the CO2 theory will reach - 85 percent when the temperature rises through the lσ level and - 98 percent when it exceeds 2σ. However, a portion of a may be accounted for in the future from accurate knowledge of some radiative forcings and more precise knowledge of global temperature. We conclude that CO2 warming should rise above the noise level of natural climate variability in this century. Is that a slinky little beast raising his hand in the audience? Well what say you: "Look Hansen, et al. only went out to 1980, just like Jastrow, Nierenberg and Seitz. Well sadly no. JNS went to 1982-3, just when the cooling trend from the El Chichon eruption kicked in and they published in 1990. Hansen, et al. published in 1981. Somehow the Marshall gang managed to avoid almost a decades worth of improvements in the models since 1981. Will someone please reassert Eli's faith in the innocent as melting snow Bill Nierenberg. Frankly, I think that we, in the Forum, have basically been “used” in what is not really a scientific debate but rather a propaganda war. I would ask you, in the strongest possible way, to prevent future misrepresentations of Monckton’s paper and its appearance in our newsletter. Editor’s response: The newsletter of the Forum on Physics & Society is not, and never has been, peer-reviewed. Our editorial comments in the July 2008 issue include the following statement: “There is a considerable presence within the scientific community of people who do not agree with the IPCC conclusion that anthropogenic CO2 emissions are very probably likely to be primarily responsible for the global warming that has occurred since the Industrial Revolution.” In fact, we have not polled any scientific community(e.g., the climate research community, the physics community, or the general science community) as to the extent of its consensus regarding human-activity-caused global warming, and we apologize for making such a remark for which we do not have supporting data. We now do know that, in addition to the American Physical Society, the following scientific organizations have issued statements and/or reports in support of the IPCC’s main conclusion concerning the role of anthropogenic CO2 emissions in global warming: The National Academy of Sciences, the American Meteorological Society, the American Geophysical Union, and the American Association for the Advancement of Science. They would have done better to read Logical Science which has a fairly complete list of learned societies world wide who point out that we are in trouble with climate change. These guys are babes in the woods. who has quite a way with words as can be gathered from Wikiquotes. But Eli thinks this is not so true. The bunny knows quite a few scientists who have sacrificed body parts and function to their art, the colors seen only once when a laser beam gets dumped in your eye, frostbite and loss of toes and fingers on arctic/antarctic expeditions, the many early descriptions of organic chemicals that include "tastes like" and more. Of course, the only reason for doing any of this is to get a grant. Eli and Ethon have been enjoying the liver and beer at Oktoberfest and chewing over developments. Blurry as we are, there are some interesting things afoot in the world of climate. floods. We use a combination of observed data, reanalysis data, numerical models and statistical models. Our clients include several hundred insurance and reinsurance companies, brokers, banks, hedge funds, regional and local governments, and multilateral agencies. profile would also be considered. Industrial experience is not necessary. To submit an application, please email a CV and covering letter to with the title '09Q1 climate hazards'. Appropriate candidates will be invited for interview in London. Lennart Olsson (Lund University, lennart.olsson@lucsus.lu.se) and I are organizing Session C-2 on Modelling Adaptation and Mitigation Strategies to Cope with Climate Change at the conference on Integrated Assessment of Agriculture and Sustainable Development: Setting the Agenda for Science and Policy (AgSAP), 10-12 March 2009, Egmond aan Zee, The Netherlands . * studies that consider climate change in the context of other global drivers of change. If you are doing relevant work with a strong agricultural system modeling focus, we invite you to submit an abstract to this session. Please note that abstracts are due 15 October. I’m working on a major new BBC science project, a follow up to 2007’s "Earth: Power of the Planet". The aim of the new series is to reveal the influence of planetary forces (geology, climate, geomorphology) in shaping human history over the last 10,000 years. Like "Power of the Planet", the series needs to be visually spectacular, full of great ocations, and featuring cutting edge science. As part of the planning for the series I'd like to ask for your help. - We're looking for exciting science projects underway in remote or visually stunning parts of the world. - Do you know of any major projects or expeditions of a geological / historical nature that might be happening over the next 12 months? - And can you think of any spectacular locations that have been rarely or never filmed that we should be looking to visit? If you know of anything and would be happy to share it with me or discuss it with me further I would be delighted to hear from you. My contact details are given below.